Blogging is fun and rewarding and you can make good money blogging about what you love to do! 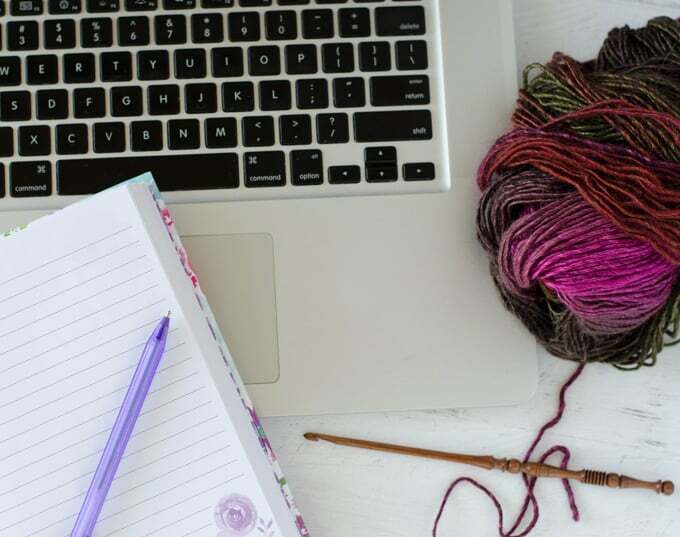 I love to blog almost as much as I love to crochet. But when I first thought about blogging, I had a lot questions. I worried about the cost because I didn’t know if I would like it. I wanted to be sure it wasn’t too hard to do. And I wondered about the whole money-making part of it. Did real people make money blogging or just super lucky people who were in the right place at the right time? In other words.. could an ordinary person in an ordinary life be a successful blogger? I’m here to tell you YES! Anyone can blog. And anyone can make money doing it. And best of all, it is super easy and very affordable to get started (keep reading to see special pricing for my readers). You don’t need a degree in computer science to figure this stuff out. Real people start successful blogs every day and you can be one of them. Follow my tutorial and in about 10 minutes your blog will be live on the web! Isn’t that exciting? Click here to start a blog on WordPress, then use the tutorial below for the easy directions! You need a domain and a blogging platform. A domain is what you call your blog. So for me, my domain is Crochet365KnitToo.com. A Blogging Platform is online software that “holds” your articles, photos, etc. There are many to choose from such as WordPress, Blogger and Wix. But WordPress is by far the most popular. It is both flexible and functional with a large group of users who share ideas and tools to customize your blog. I use and recommend WordPress and all my favorite bloggers use WordPress too. You may think.. ‘hey FREE, I like FREE’. But you don’t want this and here’s why: You can’t make money on a hosted site. You don’t own the domain name so when you come up with this super awesome name and then figure out you should have gone with the self-hosted plan, you might not be able to get the same name. And even if you think.. ‘I’ll start free and move it later’.. that’s a ton of work..and you could lose your following and links to your site. Imagine yourself a wildly successful blogger and spend those couple of bucks now to give yourself the best foundation you can by going with a self-hosted blog. What you need is a self-hosted blog (aka “WordPress.org“). This means you pay a host and you own the domain. You can buy a host and a domain separately from different companies if you want. But I’m going to assume you want to make this as easy and inexpensive as possible so this tutorial is going to show you how to get set up with a WordPress blog on Bluehost with a free domain. Disclosure: As a paying customer, some of the links below are my referral links, meaning, at no additional cost to you, I will earn a commission if you make a purchase. A host provides server space to you. When your site is on a server, others can find you on the internet. Click here to go to Bluehost and start your own blog. (The link will open in a new window so you can refer to these instructions as you go along). Note: Bluehost is always making improvements, so the screenshots you see here, might look a little bit different, but the general process is the same. I recommend the basic plan to all new bloggers. It’s really inexpensive and covers everything you need, including your domain name. You do need to pay for the first year upfront in full to get this awesome price. I went ahead and paid for 3 years when I signed up for my hosting to lock in the super low introductory price. The only other thing you may want to consider is Domain Privacy Protection which is only $0.99. That way your contact information stays safe and private. I hate getting advertising in the mail for every little thing and I don’t like someone looking up my website info and finding my home address and so I went ahead and paid for the privacy protection. A domain is your web address. You will want to think carefully about what name you want to use for your blog. I came up with the name Crochet 365 Knit Too because I like to crochet all the time and I wanted the ability to showcase some of my knitting patterns if I chose to do so at some point. I also liked the name because it’s a play on knit ribbing which is often written as ‘knit 2, purl 2’. I felt it was unique. You should give some serious thought to your domain name. Maybe do some research to pick just the right name (and one that is not already taken). If you are getting the free domain with Bluehost through my link, you will want to click on the button on the left to set up a new domain. If you have a domain elsewhere (like GoDaddy), enter it on the left side. If you need a new domain, but don’t want to choose it right now, take advantage of Bluehost’s pop up which will let you decide the name of your domain later. On the next page, enter the information for your account. 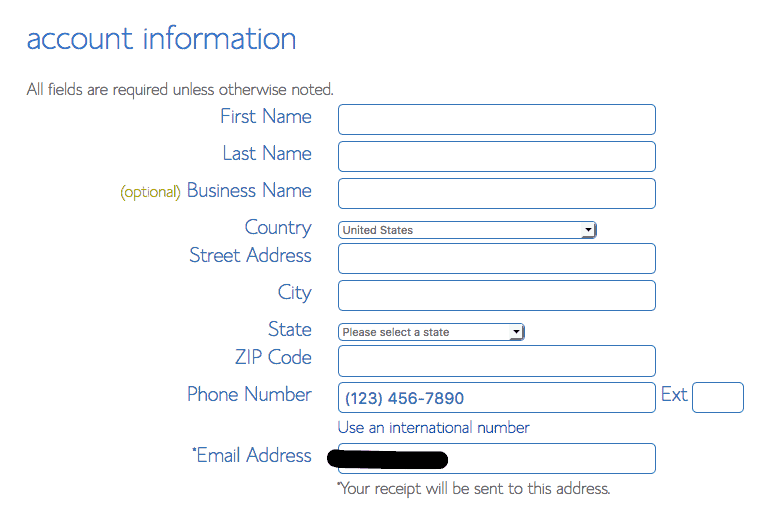 Be sure to use a valid email account since this is where Bluehost will send your login information. Next, decide how far in advance you wish to pay. 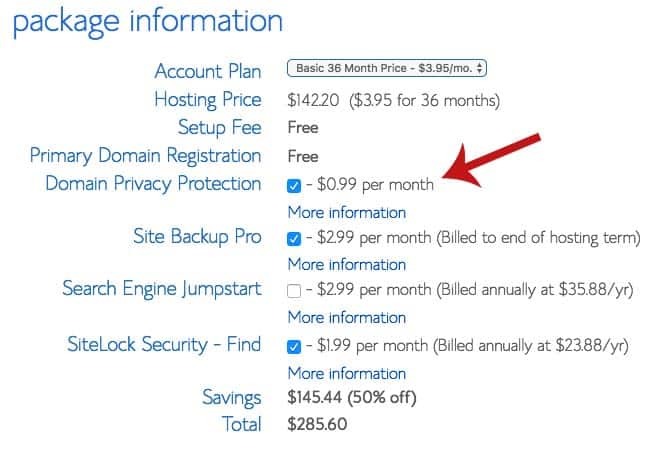 Bluehost offers a 1 year, 2 year or 3 year plan. I signed up for the 3-year plan so I could lock in the low introductory price. Don’t forget to check the box for the Domain Privacy. To start, you can uncheck the other boxes. 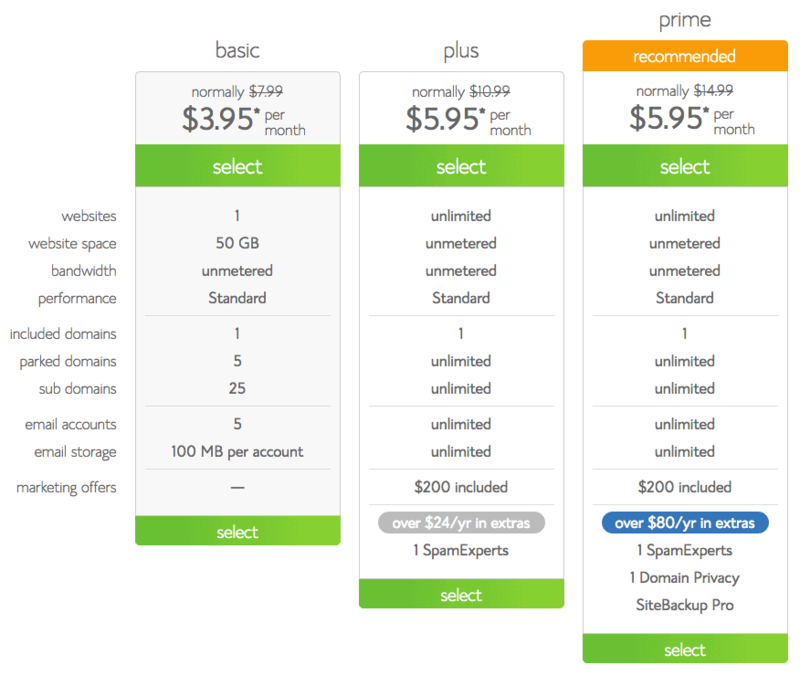 You should definitely sign up for at least a 12-month hosting plan and I recommend going ahead with the 3-year plan. It locks in your low price. Fillin your billing info and make sure you read the fine print, check the box and submit. 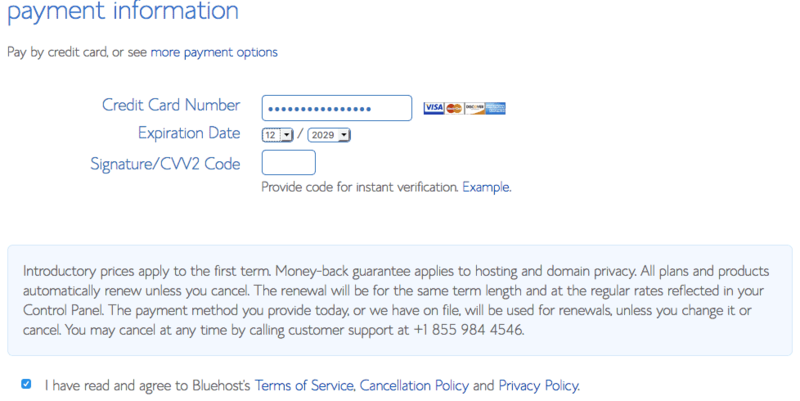 After you’ve hit submit, Bluehost might ask you about upgrades and special offers. No need to jump on these. 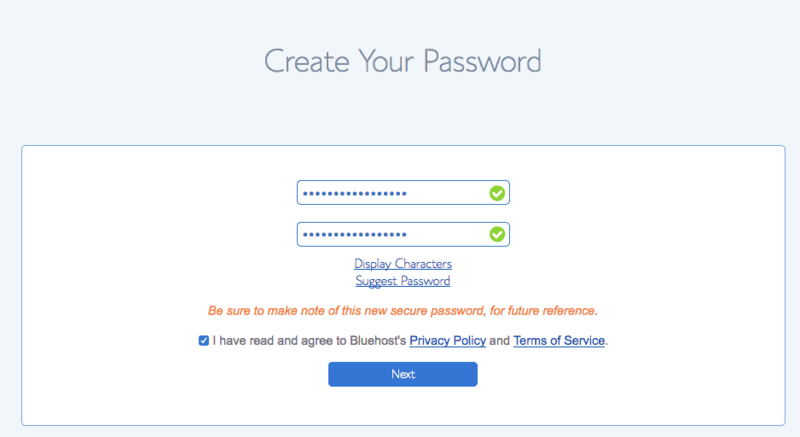 Bluehost will send you some welcome emails and they’ll include your login information. You want to make sure you find those–be sure to check your SPAM folder, if need be, and mark the emails as ‘not junk’. One of the emails will have a link to activate your domain. All you need to do is follow the prompts in the email to activate your domain. You will need this user name and password so you can sign into your blog. As of September 2017, Bluehost automatically installs Word Press! So you can start working on your site right away! Bluehost will give you an option to choose a different free theme at this point. 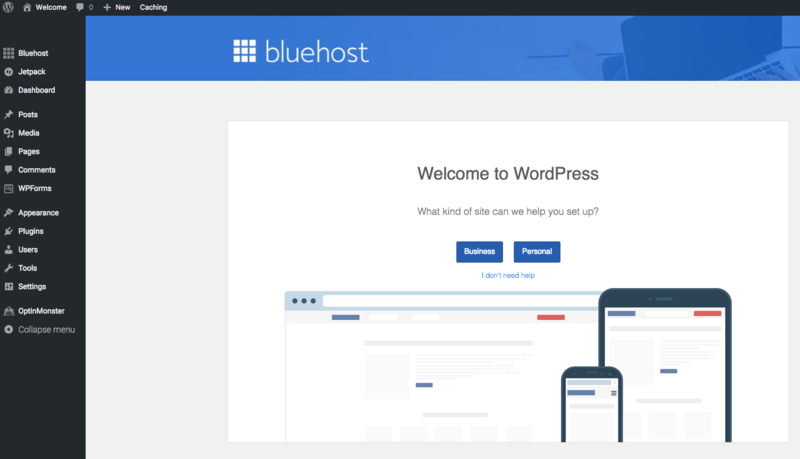 I recommend that you wait for now and just go with the free theme Bluehost automatically installed. You may want to choose a different free theme later or go with a paid theme. But you will want to do some research. Free themes are not always kept up to date and if they are outdated they may have weaknesses that hackers can exploit. I use the Genesis Framework and the Foodie Pro theme (which I’ve customized for my site). For now, I recommend you click on “skip this step” to move on and decide on your theme later. You will then have the option to Start Building your site or to go to your Bluehost Account. Click the blue button to start building your site! Note: Don’t be concerned if your site is on a temporary domain at first. Bluehost has to go through a process to register your domain, etc, which can take up to 24-48 hours. 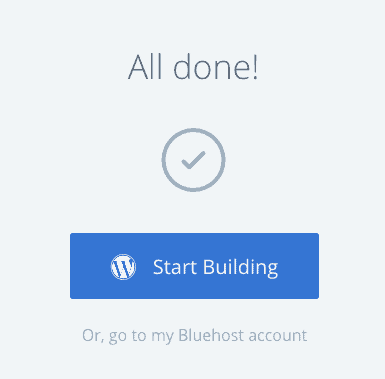 You can start working on your site and when it’s good to go, Bluehost will automatically switch it over. If you already had a domain (and did not go with the free domain with Bluehost), you can reach out to Bluehost or look in the help section to help you point your domain over to Bluehost. After you’ve clicked the “Start Building” blue button, you will be taken into the admin section of your new website! The black column to the left is your WordPress Dashboard. It is where all the action happens. From here you can access posts, pages and everything else you need to work on your blog. Please note: If you go to your website and want to get to your dashboard, just add “/admin” after your web address in the URL. That will take you to a log in screen and you can log in to your blog. If you are already logged in you will see the black bar at the top of your website and you can use the clickable links to get into areas of your dashboard from there. The email you received includes your login URL along with your username and password. Be sure to keep that information safe. This is what you need to log into your blog. You can add new posts by clicking on “Posts”. You can add pages by going to the “Pages” section. When I started blogging, I was confused on the difference. Here’s the way I like to think of it: I use “posts” for things I want in a blog format. When you come to my website, you will see the most recent post on top and the older ones (in reverse chronological order) are below that. I use “pages” for things that are more static. What you are reading now is a “page” in WordPress. It did not get posted with the other blog posts and I had to put it in a special location on my blog so you could find it. Images and other files are uploaded in the “media” section. I upload all my pictures here. When you are working on a post or a page, you have the option to “add media”. Once you click that button you will see what is saved in your media area OR you can add a file or photo from there as well. It is kind of like 2 different ways to get to the same area. There are a lot of settings in “Appearance” and “Widgets” to play around with. Here you can add items to your sidebar, footer and so on. I always recommend changing one thing at a time and then checking your website. Widgets, especially, do not always play nice with each other. They are awesome–don’t get me wrong– but just pick and choose a few to implement at a time. If you want to send out newsletters and emails to your readers, I recommend Convertkit. This is what I use and I love it. If you want to change the actual design of your blog, Genesis is the most popular. I use Genesis along with the Foodie Pro child theme. There are a lot of themes available for free or for purchase. I picked Foodie Pro because I like the ability to have my free patterns show up in an index. I use the “recipe” section of Foodie Pro to show my patterns in an photo index. I used a hack by another blogger to change the code so I could have multiple recipe sections. If you don’t want to mess with the code (which, honestly, is not for the faint of heart as you can break your blog with one wrong keystroke), I recommend going with Cook’d Pro (by the same company) because the theme has built in multiple recipe indexes. 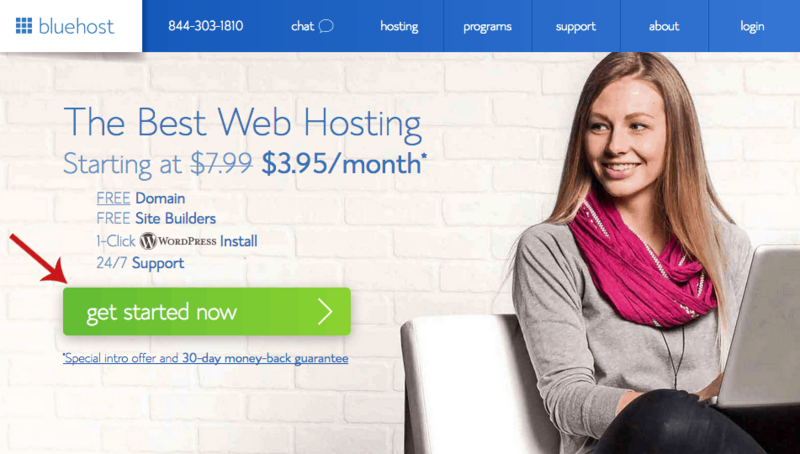 Note: if you ever do break your blog or have trouble of any kind wth your blog, call BlueHost. Their support is awesome. When you are ready to learn more, I highly recommend anything by Suzi at Start A Mom Blog. I have purchased many courses and so many have left me with a bad taste in my mouth and a feeling like I just didn’t get my money’s worth. Suzi’s ebooks and courses are top notch (after you click the link, scroll to the bottom and click on ‘all courses’ to see everything she has to offer). Great information without a lot of fluff you don’t need and at prices that don’t break your budget. I started with Suzi’s Blog By Number Ebook and for only $18 is the best deal on the internet for new bloggers. I really love her stuff and highly recommend anything she offers. Blogging is fun and rewarding. If you missed the link, just click here to get started with your own blog and then scroll back up so you can follow along with the tutorial.